Need a bit of light relief at Christmas? Our pack of eight Heath Robinson cards will waft you away on a magic carpet of absurdity. If you think that’s a tall story, there’s more. In his 1939 book Let’s Laugh, Heath Robinson came up with all sorts of bright ideas for what to do if you couldn’t get away to Switzerland. He put them together in a scene called Winter Joys in the Park which we’ve made into a light-hearted Christmas card. Short of a snow-making machine? Don’t worry, you can schuss on melted butter. Slope not steep enough? Rig up a slide from the nearest plane tree. No icy pond? Skate on a bedroom mirror. Atmosphere a tad lacking? Serve up Swiss goodies to recreate the café life of the ski slopes. You even get a couple of trademark Heath Robinson birds wanting to join in the fun. You can buy a packet of eight Heath Robinson Christmas cards for £4.95. Or get a packet free with every copy of Very Heath Robinson. Until 31st December Adam Hart-Davis’s ‘whopping (1.9 kg), wonderful new book’, to quote one reviewer, is available at the specially discounted price of £30 (25% off). And then you get free postage and packing on everything. Just add Very Heath Robinson to your basket and quote discount code 74XMAS. 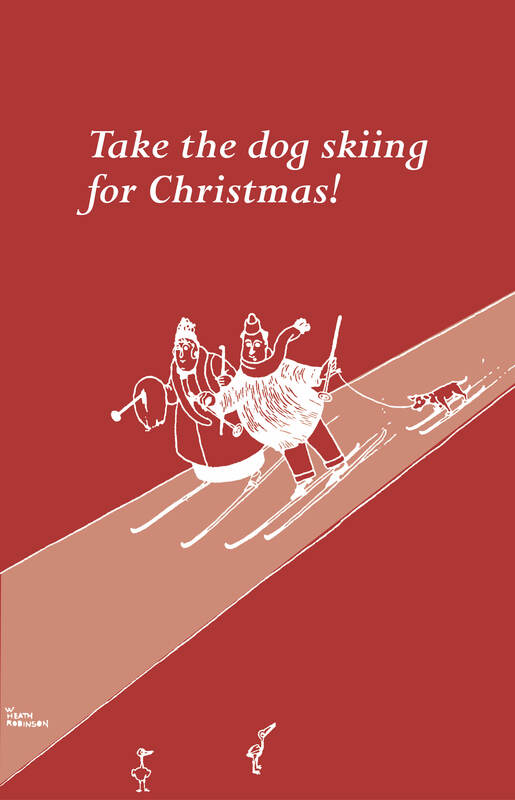 To get the full winter sports scene, go to Humorous Christmas Cards. To have a look at the book, click here.